You're a patient individual. You've been looking at that "Don't turn off your computer" message for several hours. You may have even let the update run overnight. 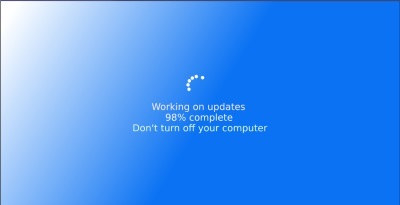 But there comes a time when you have to face it; Windows Update is stuck. I've been in this situation several times. Some of the older laptops had a tiny hole in the bottom where you could poke a paper clip to reset the machine. Newer laptops require you to pull the battery. Of course if you have a desktop you can just unplug it. Then after restarting the computer, Windows update would resume and complete successfully. But that's me. You're not actually supposed to do that because it might cause file corruption. The proper way is to go to a command prompt, stop the update service, rename the folders where the update files were stored, and then restart the update service. To do that press [Windows Key] + [x] to open the secret power user's menu. In the power user's menu, select "Command Prompt (Admin)" or "Windows PowerShell (Admin)". In the command prompt window that appears type following commands, pressing the [Enter] key after each command. Next rename the SoftwareDistribution and Catroot2 folder. Do this by typing the following commands at the Command Prompt, pressing the [Enter] key after each command. Then restart the Windows Update Services, by typing the following commands atn the Command Prompt, pressing the [Enter] key after each command. Lastly, type Exit at the Command Prompt to close it and then restart the computer. After restarting the computer retry to install Windows Updates. You can do this by selecting Settings in the Start menu (the gear icon), and in the left panel of the Settings window select Update and security, then select Check for Updates in the right panel. This is the proper procedure to fix a stuck Windows 10 Update.